This beautifully designed chat set is specifically made to be used outside all year round. Crafted of high quality cast aluminum and outdoor "All Weather" vinyl/resin fibers, this set features decorative outdoor fire glass with a hidden propane tank for a relaxed atmosphere. When the fire pan is not in use, the included decorative cover provides extra table space. 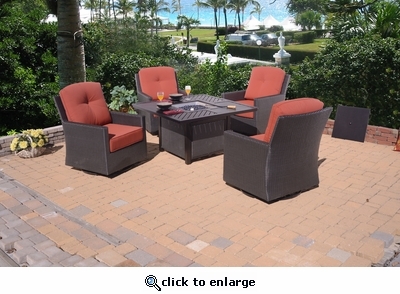 This terrific set included 4 comfortable swivel chairs with plush cushions included in your choice of indoor/outdoor fabrics. Sunbrella fabrics available for an additional cost. Available in Bronze finish.